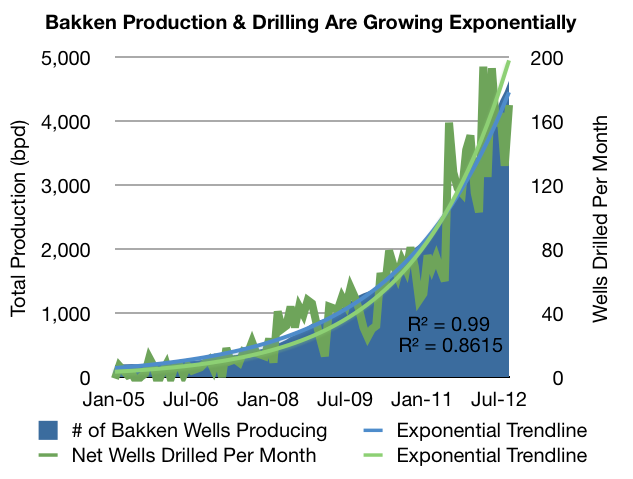 Peak Oil Proof Your Portfolio: Shale Fracking - Energy Independence or Ponzi Scheme? Shale Fracking - Energy Independence or Ponzi Scheme? Over the past few years, the hype over horizontal multistage hydraulic shale fracturing, or “fracking”, has grown louder and louder. During the 2012 election, both candidates focused heavily on the technology. Barack Obama promised to increase permitting on federal lands for fracking. Mitt Romney made fracking a cornerstone of his energy policy, promising that it would allow us to “achieve North American energy independence by 2020.” Citigroup, in a paper playing up shale drilling, announced that peak oil was dead, saying “The concept of peak oil is being buried in North Dakota, which is now leading the US to be the fastest growing oil producer in the world.” Following these pronouncements, the International Energy Agency stated that the United States would overtake Saudi Arabia in oil production by 2020. According to the IEA, this massive projected increase in production will come as the result of increasing shale oil extraction. With all of this hype over shale fracking, it’s worth looking into the possible future of the technology. 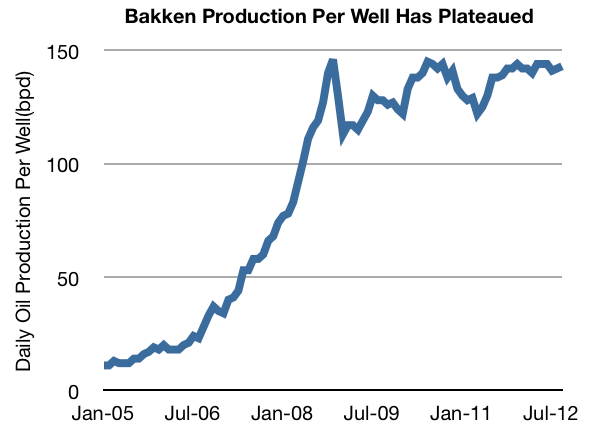 The most talked-about shale oil play right now is the Bakken formation in North Dakota. The Bakken formation isn’t really an “oil” formation in the way that most people think about it. The formation actually holds oil that is stuck in a layer of sandstone 10,000 feet underground that has extremely low porosity and permeability. This layer of oil-bearing sandstone is in turn sandwiched between two layers of shale. In order to extract oil from this low porosity sandstone, oil companies must drill about 10,000 feet down and then drill multiple long lateral wells. After they’ve drilled these laterals, they must hydraulically fracture the wells in multiple stages, between thirty and forty times per well. The water needed for this fracking amounts to about 4.5 million gallons per well. At between 1,450 to 2,940 wells per year, that’s 9.9 billion gallons of water per year. Between 0.5% and 2% of hydraulic fracturing fluid is composed of dozens of chemicals, such as hydrochloric acid and benzene, that are used to improve the flow rates of the oil and gas through the fractures. Many of these chemicals are toxic to humans and animals and can potentially cause nervous system disorders and cancer if people are exposed to them. Contrary to popular belief, most contamination of well water happens from the surface, through accidents, negligence and criminal conduct like illegal dumping, rather than from migration of fluids from the fracked well below to the surface. Hydraulic fracturing can require 1,000 truckloads of water, chemicals and other materials per well. Since most hydraulic fracturing fluid is transported by semi-trucks on public highways, spills can happen as a result of collisions and accidents. Since hydraulic fracturing began, Pennsylvania’s Department of Environmental Protection found that improper chemical disposal has contaminated the water of 350,000 people. The industry has attempted to quell opposition by disclosing the chemicals they use in hydraulically fractured wells on fracfocus.org, but according to Bloomberg, energy companies have failed to disclose the chemicals used in 2/5th of the wells that they drilled. In Texas, Oklahoma and Montana, energy companies failed to disclose the data on toxic chemicals use in more than half of the wells fracked. This failure of the industry to be fully transparent with their use of hazardous chemicals has led opponents to note that “FracFocus is just a fig leaf for the industry to be able to say they’re doing something in terms of disclosure”. Moving forward, the key technical challenge is to make these chemicals safe enough that any of the inevitable future chemical spills won’t greatly impact human health. Halliburton is at the forefront of this effort, recently introducing its “CleanStim” line of hydraulic fracturing fluids that are made entirely out of materials used in the food industry. Allegedly, both the governor of Colorado and the CEO of Halliburton have drank the CleanStim fluid to prove that it is safe. However, once the industry stops using toxic chemicals in their hydraulic fracturing fluids, opponents will likely just shift their focus to other concerns. The main groundwater contamination that occurs from hydraulic fracturing is not contamination from the toxic fracking fluids, but rather contamination from natural gas escaping from the fracked wells. According to research by the National Academy of Science, 85% of drinking water wells tested in the Marcellus shale region contained methane. Wells that were within 1 mile of a natural gas hydraulic fracturing operation were 17 times more likely to be contaminated with methane. Worse still, the methane levels in the average well in a drilling area were above what government agencies define as “hazardous”, where the methane level could potentially lead to an explosion or asphyxiation of home occupants. By carbon-dating the methane they were able to determine that the methane was hundreds of millions of years old, and therefore caused by natural gas hydraulic fracturing, and not by natural methane production in the soil. Using an infrared FLIR gas leak detection camera, Cornell scientists have captured video of clouds of methane being released from gas drilling sites during hydraulic fracturing. This is why in movies like Gasland, people are able to light the water from their kitchen faucet on fire. Air pollution is another major concern for the general public. According to a report by the Colorado School of Public Health, residents living within half a mile of wells that were being hydraulically fractured had a higher risk of exposure to cancer-causing volatile organic compounds (VOCs) like benzene. More studies certainly need to be done, but these preliminary results show that air pollution may be another major concern for local residents who oppose hydraulic fracturing. Earthquakes are another concern. In the scientific world, man-made earthquakes are known as “induced seismicity”, and it is generally agreed-upon by scientists that hydraulic fracturing can lead to induced seismicity. More recently, empirical evidence has begun proving the link. A government report by the Oklahoma Geological Survey, found that there is evidence linking 50 earthquakes in Garvin County, Oklahoma to hydraulic fracturing taking place there. Another study of hydraulic fracturing in the Bowland shale in the United Kingdom found that there is “strong evidence” that the earthquakes experienced in this region were the result of hydraulic fracturing. Recently, the city of Basel, Switzerland experienced a large earthquake linked to fracking. The city is particularly concerned with earthquakes as in 1356, it was hit by a 7.1 magnitude event, the largest recorded earthquake in Central European history, which destroyed most of the city. A report by the National Academies found that as drillers were hydraulically fracturing an underground rock formation for a geothermal project in 2006, “more than 10,500 seismic events were recorded”, culminating in a 3.4 magnitude earthquake that was “clearly felt by the local population”. These earthquakes can cause expensive structural damage to people’s homes and businesses and are the basis for further opposition to hydraulic fracturing. Climate change is also a major concern of hydraulic fracturing. In the fall of 2011 I had lunch with Robert Howorth, a Cornell professor of Ecology and Environmental Biology, and discussed this issue at length with him. Howorth has recently become rather famous for his 2011 research paper, titled “Methane and the greenhouse-gas footprint of natural gas from shale formation”, which found that electricity produced by natural gas derived from hydraulic fracturing is more damaging to the climate than electricity produced by coal. This is due to the fact that methane is a far more potent greenhouse gas than carbon dioxide, and during the drilling, hydraulic fracturing and transportation of natural gas by pipeline, a large percentage of the methane is vented into the atmosphere. If the lifecycle greenhouse gas emissions of natural gas from fracked wells are really worse than coal, any future climate legislation will put an immediate halt to such activities. In addition to the environmental concerns over hydraulic fracturing, there are also numerous concerns over the resource use of such activities. Each well requires approximately 5 million pounds of sand and proppants to hold open the well after hydraulic fracturing has taken place. This means that 11 billion pounds of sand need to be imported each year into North Dakota from places like Wisconsin. Getting the produced oil and gas from these fracked wells to market is another major challenge. For example, since there isn’t enough production capacity in the oil pipelines to get the Bakken oil out of North Dakota and the Keystone XL Pipeline is currently pending an environmental review, about 20% of the oil is being exported by railroad tanker car. The largest railroad in North Dakota, BNSF, is handling most of the traffic, which is benefitting Berkshire Hathaway shareholders handsomely since Warren Buffett purchased the railroad in 2009. Decline Rates and the "Fracking Tredmill"
Perhaps the most important issue for shale wells is their jaw-dropping production decline rates. Unlike conventional oil wells, shale oil wells peak faster and have a faster decline rate after they’ve peaked. Production from Bakken shale wells falls off a cliff after only the second month of production, losing about 80% of the production capacity by the second year. In June of 2011, hundreds of documents were leaked to the New York Times, showing that the depletion rates for shale gas were substantially higher than those used by investors to model the investments and that as a result, “less than 10 percent of the wells had recouped their estimated costs by the time they were seven years old”. In the Bakken shale of Montana, oil production as of the summer of 2012 is down 38% from its peak in 2006. Bakken fields in Montana peaked just 6 years after they were first drilled and have declined by a third in the 6 years since their peak. 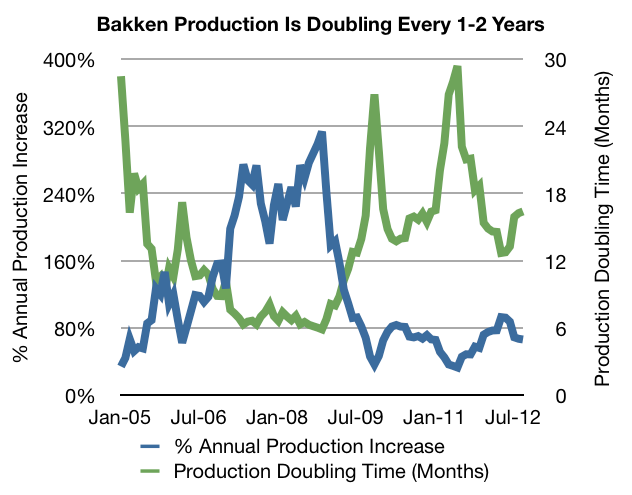 It remains to be seen, but the much-hyped Bakken shale play in North Dakota could follow a very similar trend. As you can see from the production curve of a typical Bakken oil well, the depletion rate is extremely high. 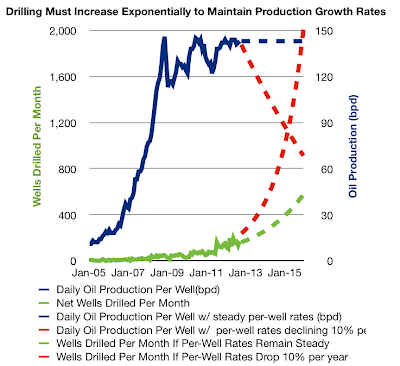 Production peaks immediately and within just 6 months the well is running at half of its peak production rate. Within 5 years the well has produced half of its lifetime production and is running at a rate that is only 10% of its peak production rate. With these extremely high decline rates for wells, in order to keep production from a field up, drilling needs to increase at an ever-increasing pace. This, of course, is unsustainable, and after a certain period of time, overall production for a region will peak and decline. 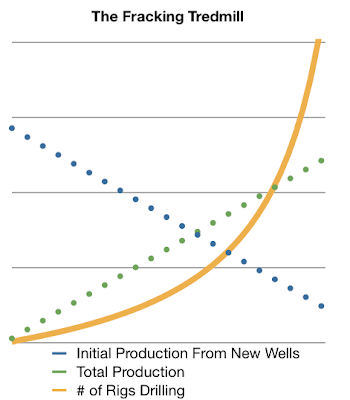 To explain this visually, if we assume that oil companies are fracking the most productive wells first, then the initial production of new wells drilled will decline over time. If oil companies wish to increase production over time, for example to offset the decline from peaking conventional fields worldwide, then they will need to increase the number of rigs drilling in the region every year. Since the depletion rates are so high, however, this linear declining initial production curve combines with this linear increasing overall production curve to create an exponentially increasing rig count. 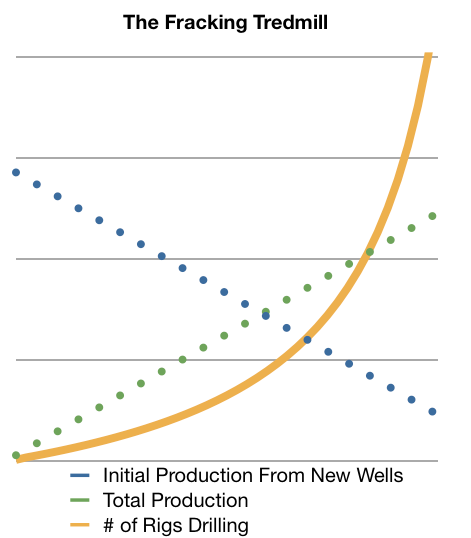 If drillers wish to increase overall production at an exponential rate, by say 5% each year, the exponential rig count curve will rise even more steeply. Of course operating an exponentially increasing number of rigs in a finite location is impossible. You would run out of available fresh water, you would run out of available skilled labor, such as drillers and engineers, you would run out of places to dispose of fracking fluids and finally if growth continued exponentially you would run into the logistical impossibilities of cramming more and more drilling rigs onto a finite number of now congested country roads. Along the way to hitting each one of these limits, local opposition would grow louder and louder. Nevertheless, companies will likely continue to increase their operations in these areas until they reach these limits. Since 2005, oil production from the Bakken Shale has been growing exponentially as a result of shale fracking. This exponential increase in production rates, however, has only been possible with the exponential increase in drilling rates. 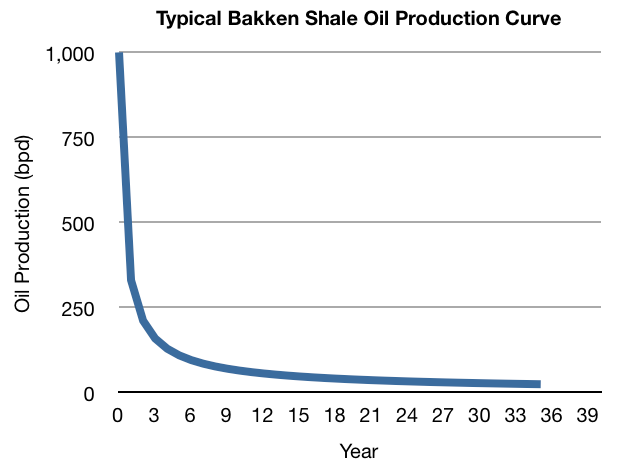 When we chart the production rate in the Bakken formation against an exponential trend line, we see that it has an R-squared of .99, meaning that the curve is almost perfectly exponential. Hydraulic fracturing has allowed oil producers in North Dakota to increase the production per well from under 20 barrels per day before 2005 to an average of about 140 barrels per day now. When this increase in well productivity is combined with an exponential increase in drilling, we see that oil production growth rates have skyrocketed. In the first few years of hydraulic fracturing, oil production was doubling every few months. Today, oil production is doubling every 12-24 months. 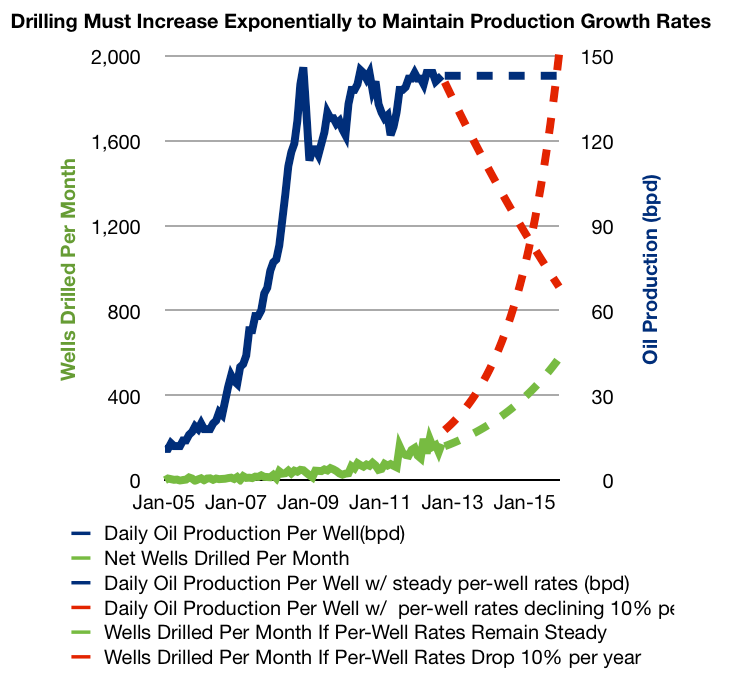 If oil producers wish to continue increasing oil production at these rates - doubling every 12-24 months - they will need to continue to increase the number of wells drilled at an exponential rate. If well production rates remain above 140 barrels per day, the number of wells drilled per month will need to rise from about 170 wells drilled per month to over 500 wells drilled per month in just three years. This, by itself would be a tremendous increase in drilling activity. However, per-well production rates may not remain at this high of 140+ barrels per day. Because drillers begin with the “low hanging fruit” of highly-productive regions, it is probable that this per-well production rate will decline as drillers move to less attractive drilling locations. If the per-well production rates begin to decline by just 10% per year, the number of wells drilled per month will need to rise from just 170 per month today to 2,000 wells per month in just three years in order to maintain the increasing levels of production experienced today. This would require over 10 times the number of drilling rigs to be operating in North Dakota in just three years. The first limiting factor may be the availability of rigs. According to Baker Hughes, there are about 178 rigs operating in North Dakota right now. This represents about 10% of all of the rigs operating in the United States. Increasing the number of rigs 10-fold would require us to move every single rig in the United States to North Dakota, abandoning drilling in all other areas. Clearly, this is an impossibility. There are about 1,000 idled rigs in the United States right now. Moving these rigs to North Dakota could help, but most of these rigs are incapable of the horizontal drilling required for shale oil production. Another possibility is for manufacturers to pump out more rigs. According to National Oilwell Varco’s Rig Census, 2011 was a record year for rig manufacturing with 158 new rigs added to the US fleet. These additions, however, were not enough to offset the number of older rigs being retired and in 2011 the total number of rigs drilling in the United States actually shrunk. According to NOV, “the number of newly built and rebuilt units could not keep up with those being retired.” If drillers were somehow able to completely halt the scrapping of old rigs and if they were also able to send every single newly manufactured oil rig to drill in the Bakken shale, this would only get them another 1/4 of the way to the ultimate goal. The number of rigs available seems to be the most immediate impediment to the continued increase in Bakken oil production. When you consider that each well can require 1,000 truckloads of water and sand to drill, this increased rate of drilling would increase the number of truck trips on local roads from 170,000 per month today to over 2 million truckloads per month in just three years. The first limiting factor may be the capacity of rural roads. Two million truckloads per month could result in severe truck traffic congestion. Since federal law limits the number of hours truck drivers can work per day, it might be impossible to simply find enough truck drivers. With local residents already angry at the increasing number of trucks on their rural roads, public outcry may also limit the drilling by limiting the number of trucks driven on local roads. At these drilling rates, water becomes another major issue. Because each well requires 2.5 million gallons of water, drilling 2,000 wells per month would require 5 billion gallons of fresh water per month. Already the water table in North Dakota is declining by about 1.2 feet per year. Increasing the amount of water use 10-fold by increasing the amount of drilling 10-fold would deplete the groundwater reservoirs at a significantly increased pace. Is Shale Oil A Ponzi Scheme? Most lease agreements signed by natural gas companies have a “use it or lose it” clause, requiring them to drill and produce gas from the fields within the first few years or lose the lease. Such clauses make drilling unprofitable wells potentially advantageous in order to create “real options” for the companies and maintain reserve numbers, which allow companies to keep their reserve replacement ratios up, thereby keeping their stock prices up. This exponentially increasing rig count requirement and current uneconomic drilling have caused some industry experts to call the practice of shale fracking a “Ponzi Scheme”. Others have compared the practice, which generates negative cash flow but makes for a great “wall street story”, to the types of activities that Enron was engaging in. Clearly there are some questions about the sustainability of shale fracking, but it remains to be seen if the shale industry will implode in on itself. These issues aside, public sentiment may kill fracking before the economics do. Given all of the public concerns with hydraulic fracturing, the practice has already been banned in both France and Bulgaria. Hydraulic fracturing has also been banned in Quebec, Nova Scotia, Vermont, New Jersey and in 50 local communities in New York. Given the increasing impacts on local citizens from exponentially increasing drilling rates, this trend of banning shale fracking may continue to grow.